I’m pleased to welcome B.J. 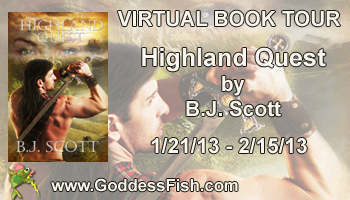 Scott to my blog today to talk about her release, Highland Quest, share an excerpt and give everyone a chance to win a great prize! CERIAN: Welcome, B.J.! Can you tell us a little bit about yourself? B.J. 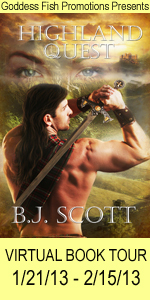 : With a passion for historical romance, history in general, and anything Celtic, B.J. always has an exciting work in progress. Each story offers a blend of romance, adventure, suspense, and, where appropriate, a dab of comic relief. Carefully researched historical facts are woven into each manuscript, providing a backdrop from which steamy romance, gripping plots, and vivid characters—dashing alpha heroes and resourceful, beguiling heroines you can’t help but admire—spring to life. A PAN member of RWA, World Romance Writers, Celtic Hearts Romance Writers, and Savvy Authors, B.J. also writes contemporary, paranormal, time travel, and romantic suspense. CERIAN: Fantastic! I’m in love with anything Celtic (must be my name). I love the sound of your home. What does your writing area look like? B.J. : Since I work full time, have a small business on the side, have a home, hubby, four dogs and a cat to care for, I write when and where I can. I usually write in my big easy chair beside the fireplace, but have been know to write anywhere I can. CERIAN: I can relate. It’s good to be able to write wherever you want. Not everyone is that focused. What is your favorite genre to write (though I think I can guess) How many genres do you write? B.J. : My favorite genre is historical romance. I am particularly fond of anything Celtic or Scottish, love books about the American Civil war and Native American history. I have works in progress involving all of these time periods. I also have an interest is paranormal, time travel, romantic suspense and the occasional contemporary. I also have books either written and awaiting revisions or planned in these genres as well. CERIAN: That’s quite a wide variety! You must spend lots of time researching! What inspired your latest story? B.J. : Highland Quest is the sequel to Highland Legacy. While I planned to write three books and possibly four in this series, I had not intended to write Highland Quest right away. However, I was very fortunate to have Highland Legacy so well received and given the number of requests for a sequel, I put aside my other works in progress and started this one earlier than planned. At first it was a slow go, but once I got into the story, it flowed much better. Upon finishing it, the muse was fresh and the story line for the third book, Highland Homecoming, was ready to be written. I hope to finish it and have it ready for release in the spring of 2013. CERIAN: Excellent! Must be wonderful to have your fans request a sequel! What is your typical writing day like? B.J. : I get up early, see the dogs are taken care of and have my morning tea. Once that is done, it all depends on if it is a weekend or week day. I work full time as a child care provider for special needs kids so usually am out the door at 9 am and do not get home until 6 pm. After dinner is over and I have checked my emails and blogs etc, I try to find time to write. On the weekends, if I am not away for my small business, I try to get up early and write, since mornings are my most productive time. Basically, I write when and where I can so it might me late in the day or early morning. On a good day and when the muse is talking, I have been known to write from early morning and into the wee hours, only taking a break for essentials. But that does not happen as often as I would like. CERIAN: That is quite a schedule! I’m very impressed. What else do you like to do besides write? B.J. : When not working or writing, I enjoy camping, antiquing, visiting historical sites, reading and relaxing with my hubby. I also do a variety of handcrafts and my small business involves machine embroidery and heat pressing pictures onto items like mugs, and other assorted items. CERIAN: Very busy! I admire people who can do embroidery. I never could do it, though I always loved to paint. Okay, I have a bunch of short answer questions. Favorite movie: toss between Braveheart and Dances with Wolves. Best vacation ever: Honeymoon in Hawaii is the best I have been on, but dream of going to Scotland some day. Okay, now let’s find out more about your book, Highland Quest! No longer content in the shadows of his older brothers and on a quest to find his destiny, Bryce Fraser’s chosen path is fraught with danger, passion, and decisions. Can his unspoken love for spirited, beguiling Fallon be triumphant in a time of war and uncertainty, or will they both fall prey to the devious plans of a traitorous laird from a rival clan? “Wa . . . water,” Bryce mumbled, but there was no one there to listen. His throat was parched and he ran his tongue over dry, cracked lips, but his action offered no relief. An entire loch lay only a few feet away, but he couldn’t muster the strength to drag himself to the bank and quench his thirst. Despite the sun beating down on him, he’d swear he was encased in ice. His life’s blood seeped from his wounds, soaking the ground beneath him. He tried to raise his head, but the excruciating pain radiating across his chest stole his breath away. Was this what it felt like to die? If so, he prayed the Almighty would be merciful and take him now. Bryce moaned, a shift in his position bringing on another nauseating wave of agony. He sucked in a short, sharp, gulp of air and stretched his arm out as far as he could, his fingers grappling in the dirt. If only I could reach my sword. Beads of perspiration dampened his brow. As the strength slowly drained from his body, drawing a simple breath became more difficult. The end grew near. No time to make amends for sins of the past, and he had committed his share. Regrets? He had those, too. “Fallon.” He whispered her name then heaved a ragged sigh. B.J. will award gifts of swag (including a canvas tote bag, a mouse pad, a pen, book thong, bookmark, can cooler, magnet, and key chain — US/Canada only) to randomly drawn commenters from this tour and her Virtual Book Tour, and a grand prize of one $50 Amazon GC to one randomly drawn commenter from this tour and her Super Book Blast. So make sure you stop in on her other blog stops for more chances to win! Highland Tour sounds fabulous, nice one BJ. I love the Lion, the Witch and the Wardrobe too — definitely in my top five books. Wishing you many kerchings of the virtual sales till. Glad you could drop by. This is book 2 of my series, but I have done them so they can stand on their own. CS Lewis was a talented man and I found myself enthrawled with his book. Back then(dating myself here lol) the other books were not available so I read this one over and over. It has always been one on my list and a hard cover verison is a gift I often give to a new baby or small child for a special occassion. I love Lion, the Witch and the Warderob as well. Your book sounds great as well! You are a new author to me! This book sounds wonderful and I can’t wait to read it! Adding to my TBR list now! Have wonderful day! Thanks Ami, glad you enjoyed the interview and thanks for dropping in to comment. Nice little snippet there. I love reading historicals, which I could write one…but until then, I’ll just enjoy reading them. Good luck with Highland Quest! Busy woman, BJ! I’ve read a lot of your suspense books and you are a fabulous writer! Congrats on the new books coming out and have a wonderful tour. I just love this book’s cover. The eyes in the clouds are mysterious, and intriguing. The story sounds great. Thanks for the compliment, but Highland Legacy, the book I had released last fall was my first book published 😉 I do know there is another BJ Scott who writes M/M books, but that is definitely not me, but finding out after my first book was published there as a self pub author who did not show up in my original search had the same pen name. Unfortunately, it has caused some confusion. I was not aware there was one who wrote suspense too. I do write romantic suspense, but have yet to publish one. I am concentrating on my historical books first. Thanks again for dropping in to say hello. I appreciate it very much. 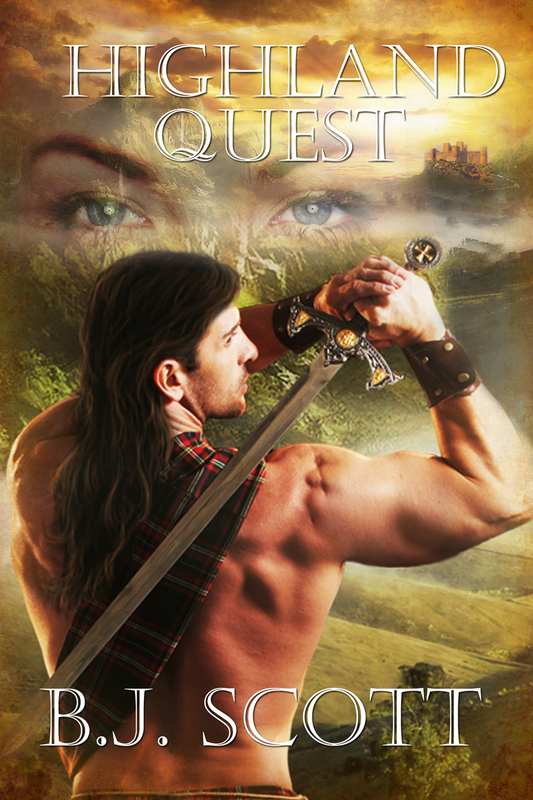 I appreciate this opportunity to introduce my newest book, Highland Quest. This is the second book of my Highland Series. HIGHLAND lEGACY, the first book was released in Nov 2011 and is also available at Amazon, B&N, Kobo and Soul Mate Publishing. The Third Book HIGHLAND HOMECOMING, is to be released in the summer of 2013. While a series, each book is writen to stand on its own so you can read them in any order and not be lost. Yikes can you tell it has been a slow start today LOL in my previous post, I misspelled the title of my first book so will quickly reacap. There may be a fourth but have not yet decided. It’s my pleasure! I’m a sucker for a good Highland romance, so seeing your cover on my page is awesome! I’m also a Soul Mate author, though my first release is in edits and Rae did my covers. She does such a wonderful job! I knew you were with Soul Mate too, so having you pick up my book for the blog tour made this stop even more special. I have read the blurb for your book, No Going Back and it sounds wonderful. I wish you much success with it. What a really outstanding review. Each time I read that excerpt, I want to cry. I love a good romance and this setting is brilliant! I also love historical romance. I’m a big fan of books set during the American Civil War and anything that’s Native American related. Thank you for a great excerpt. Thanks for dropping by Rita Wray. This sound like a fabulous series! Wonderful interview , BJ! Best of luck with Highland Quest!!! Thanks so much for dropping by Darcy. It is always wonderful to see another Soul Mate author. I appreciate your support. Glad you enjoyed the interview. Great post ladies, always love highland romance 🙂 Congrats B.J. ! Hey Mandi, thanks for dropping by. Always nice to see you and appreciate your support. A fabulous post thank you. I enjoyed the interview. Thanks for dropping in today Mary. So nice to see you. Thanks for stopping by and your continued support . It means a lot. Wishing you sucess with your books too.